America's First Lady attended the soiree, called 'Sunday of Fun', at the No Doubt singer's Los Angeles home, with the event aimed at enticing politically-active parents to bring their children along with them for some games and food. Tickets cost upwards of $2,500 per family of four and other guests included Nicole Richie, Joel Madden and Alyson Hannigan although Gwen's husband Gavin Rossdale was a notable absentee. 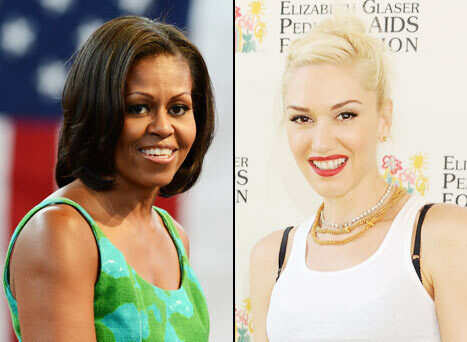 The 'Sunday of Fun' event was part of Michelle's husband Barack Obama's re-election campaign and Michelle thanked Gwen - who has two sons, Kingston, six, and three-year-old Zuma - for hosting such a great bash. She said: "I want to thank Gwen, in particular, for being so kind and gracious and hosting us all here at her beautiful home. And even though Gavin couldn't be here, I also want to say a special thank you to him as well, and also to Kingston and Zuma. I mean, they are letting all of us just enter their house, all the chaos, and they're being so good about it today. So thank you, guys, for letting us come - indeed." Barack will run against Mitt Romney in a bid to become the US President for a second term and Hollywood stars such as George Clooney and Sarah Jessica Parker have already hosted fundraising events for him.